First things first: I have never been a true wearer of gloves. 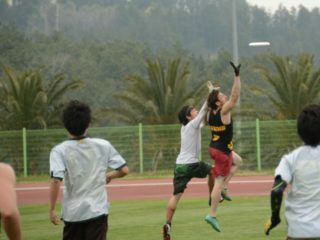 While many of my peers who enjoy throwing a disc around as much as I do embrace gloves, claiming that they provide added consistency across playing conditions, I always doubted the idea that wearing gloves would improve my consistency. Call me old school, but I like the feel of the ridges on the disc in my hand and nothing between it. When it is cold, wet, or humid, I just grip it tighter and push down on the ridges harder. Recently, I tore my ACL and I was forced to take a hiatus from playing. In the months of downtime and watching film, I started to reconsider my stance, especially as I started watching more games in adverse conditions. When I saw the opportunity to review a glove, I was excited, because from a quick internet search, I know that Huck Nation had addressed one of my major concerns about wearing gloves: seams. Over the past few weeks, I gave the Huck Nation Beta 3 gloves a chance, and have some mixed thoughts. I obviously am not an experienced glove wearer, but I have tried on many pairs of gloves over the years (I used to play fastpitch softball from youth through college, and had lots of struggles trying to find batting gloves). My expectations of gloves might be different than yours, but my review is pretty honest. I have never been a glove-wearer in any of the sports I played. It was at a young age that I realized, my fingers are not all proportionate and it lead me to believe I would never find a pair of batting gloves that would fit the way they fit my peers. My thumbs are especially problematic because they are longer proportional to the rest of my fingers. This means that in order to find gloves that have enough length to fit my thumbs, they are usually too big. This is exactly the case for the Huck Nation gloves. Knowing that this would be true, I asked for a variety of sizes so I could see how it might fit if I did not have weirdly long thumbs. Once I sized down so the rest of the fingers fit, the gloves were not loose. In Huck Nation’s defense, they have an extremely accurate sizing chart on their website. The site instructs you how to print out the sizing page and accurately find your size. Trust the sizing chart, because unlike other companies I have seen online sizing for Huck Nation got it right. If you have narrow fingers, the finger width might be a bit loose. I will say that it is tighter fitting than other glove products I have tried on, so any improvement is worth a lot in my book. The wrist is extremely comfortable for having a wider band than any other gloves I have tried on. I love the elastic and how tight they can be pulled without feeling too stiff or restricting. The velcro is sewed on well and seems like the most durable, yet comfortable part of the glove. I am a huge fan of how secure they feel without losing any comfort. The sizing chart accuracy and the wrist material comfort is why I gave it a 5/5. I understand that my weird thumbs will never allow me to find a glove that fits the rest of my hand properly, and the fact that the sizing chart is extremely accurate says that they properly represent what they are advertising. My grip for throwing is unimpeded by seams because of the the way the tacky material is applied to the gloves. It covers the already minimal seams to make the gloves appear seamless, which is huge for a thrower like me who enjoys throwing barrages of flick hucks at my leisure. The lack of seams provides a consistent throwing grip for accurate forehands and backhands at a range of distances or release points. However, the tacky/sticky feel of the grip largely depends on your hands being warm. In other words, the material is not great if your hands are cold or it happens to be cold outside. I happen to live in Wisconsin where winter is fully upon us. Outdoor throwing sessions with these gloves are not awesome, because they do not seem to improve my grip in the cold. I understand that these are not “cold weather” gloves. It is 40 degrees out right now and I do not need “cold weather” anything on my hands: I merely want extra grip. In the cold, the sticky feel is not going to be there unless they are wet (and cold + wet do not mix). On the other hand, when worn in an indoor (or warmer) situation, they are fantastic. My hands get pretty sweaty when I play, so it was nice to find a product that worked really well under those conditions. Whether the gloves were just a little wet or soaking in sweat, they had a consistent grip/stick to them that felt like my hands were dry and without gloves. The whole draw to gloves for me is to provide consistency across playing conditions. If you live in a place with variable climate, like I do, these gloves might not be for year-round use (unless you are only playing indoors or have really sweaty hands). The catch with this glove is thing at Huck Nation knows it is not meant to be a season-long investment. The fact that they put that fact in the rating on their site tells you what to expect. 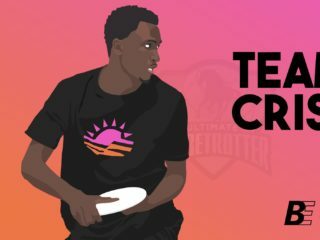 They are not a long-term investment, and if you play a lot of ultimate, you can’t expect them to last longer than a month or two. Well, judging at how quickly my husband goes through gloves, this seems on par with glove companies that promise that they will last longer, but do not deliver on the promise. 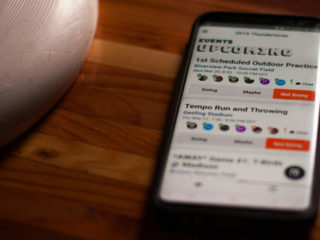 I am not playing oodles of ultimate games or attending regular practices, so I really can’t speak to the wear and tear of the gloves in regular in-season environments. I would venture to say that since these gloves are lighter than most other brands I have seen on the market for ultimate, that I would imagine that the lighter design and thinner materials might affect how long they last. These look like like glorified gardening gloves. I am not fan of the two-toned color or the appearance that they were dipped into something, but I do like the wide wrist, printing of the logo, and minimalist design. To be honest, the two-toned color scheme disappears when my hands are sweating profusely, so they just look like they are all dark gray, so it only takes away from the look before they are used for a prolonged period of time. Despite looking like gloves I might perform yard work in, the materials are high quality. The flexible, stretch of the back part have the feel of high performance gear. As stated above, the craftsmanship of the wrist is well-made, comfortable, and seems like it will be the longest-lasting part of the entire glove. They chose high quality materials and assembled the glove in a minimalist way that does not over-think the function of the glove. Bravo! I generally think that with a minimalist, light design that does not promise a long-lasting product, you cannot expect it to be something you are really investing in for the future. The gloves are only $15 per pair, which is less than competitors’ gloves. If you are okay dropping $15 every month or so (realistically, this is about the maximum I would imagine they would last given the way I typically treat things and how I play), then this would be a good value for you. The gloves are exactly what they promise: an affordable investment for about one month of playing ultimate on a regular basis. They are not promising anything above that, and they are less expensive than other products that might last 2-3 months total. If you are looking for a pair of gloves to last you the entire season, then these are not the gloves for you, but then again, you are not likely to get a pair of gloves to last through an entire season of heavy ultimate for $15. Although it largely depends on if you’re using the gloves for warm or cold use, these gloves are a great buy. The sizing chart’s accuracy is spot on, so it is a no-brainer solution to trying gloves for the first time, or switching brands. The materials are comfortable and the wide elastic wrist make these gloves easy to get used to. I would obviously prefer an all-black design to a gray one, but I certainly cannot complain. Based on what I perceive the quality to be, I am eager to see how well they hold up after hand washing them. If you’re not worried about the gray color, these gloves are a great value – pick up a pair before you hit indoor a tournament in a warm climate!